For the beetle genus, see Alluaudia (beetle). Alluaudia is a genus of flowering plants in the family Didiereaceae. There are six species, all endemic to Madagascar. 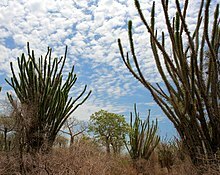 Most occur in the southwestern subarid forest-thicket vegetation of the island. Spines are arranged around the leaves as a defense against herbivores. The spines are several meters above the ground, and probably evolved in response to herbivory by now-extinct lemurs, such as Hadropithecus. Several lemur species living today feed heavily on Alluaudia, such as the ring-tailed lemur (Lemur catta) and the white-footed sportive lemur (Lepilemur leucopus). ^ Alluaudia. Madagascar Catalogue. eFloras. ^ Schatz, G., et al. Modeling of endemic plant species of Madagascar under climate change. In: Assessing the Impact of Climate Change on Madagascar's Livelihoods and Biodiversity. Conference. Antananarivo, Madagascar, 28 January 2008. ^ Crowley, B. E. and L. R. Godfrey. (2013). Why all those spines? : Anachronistic defences in the Didiereoideae against now extinct lemurs. South African Journal of Science 109(1-2), 1-7. GRIN Species Records of Alluaudia. Germplasm Resources Information Network (GRIN). This page was last edited on 16 February 2018, at 02:39 (UTC).